DVD contendo o resultado de uma longa pesquiza realizada pela Universidade da Florida sobre preparação física para artes marciais. Neste material você encontra mais de 100 exercicíos voltados para desenvolvimento de FORÇA, VELOCIDADE,AGILIDADE, CONDICIONAMENTO RESPIRATÓRIO, CONDICIONAMENTO MUSCULAR, CONDICIONAMENTO ANAEROBICO,FLEXIBLIDADE E REFLEXO. Achieving and maintaining the high level of fitness required for martial arts training is a scientific process. The training methods you use and the way you workout can greatly affect your success in the ring and on the street. 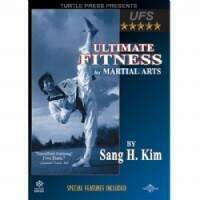 In this informative DVD, Sang H. Kim has brought all of the exercises in the Ultimate Fitness video series together into one powerful presentation. He teaches you the exercises that have helped him maintain ultimate flexibility for over 20 years and demonstrates the most effective exercises for developing explosive power and speed in your techniques using weight training, running, isometrics, and more. Plus, get advice on developing hard to work areas like agility, balance, coordination and timing.